At Huronia Overhead Doors, we can help you discover the perfect garage door for your home. Create a unique look. Make a statement. 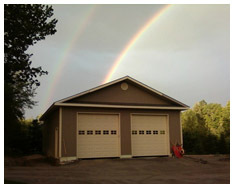 Our quality garage door systems are ideal for remodeling or new construction. Choose from a wide variety of door styles and aesthetic options to fit any style of home, cottage or boathouse. Are recreated to give homeowners a door that is not only constructed entirely of steel, but has the authenticity of the traditional wood carriage house doors. There's nothing like the look of cladwood garage doors. Preferred by many for their likeness to wood, affordability and durability. Cladwood is made from real wood composites with resin impregnated overlays or wood look alikes. These traditional looking heavy-duty steel doors are the perfect choice for your home. They are available in a variety of colours.